Sometimes, a good cuppa coffee is all we need to lift our spirits in the morning. 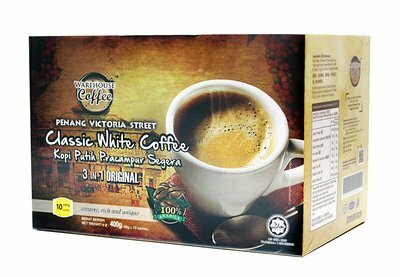 Penang Victoria Street Classic White Coffee is made from 100% high quality Arabica beans that has a crisp, bright flavour with a pleasant acidity. It has a rich, creamy layer on top and has an aftertaste of caramel with the perfect hint of bitterness. All you have to do is empty the contents of the sachet into your favourite mug, pour in boiling water and your cup of rich and creamy white coffee is ready to be enjoyed. 1. Pour one pack of Classic White Coffee into glass, add 120ml of boiling water. 2. Stir, add ice cubes and enjoy. 1. Pour one pack of Classic White Cofee into cup, add 200ml of boiling water.